We are excited to continue our Giving Tuesday Angels in Adoption Campaign! In case you missed the announcement, this year we are so excited to raise money for four very special families! 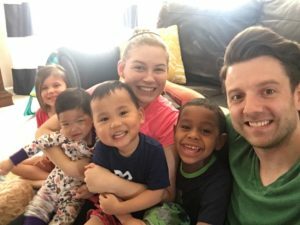 Last week you met the Johnson family, and their son Noah. We met our beloved daughter, Clara Jane Rou, on July 24, 2017 in Ningxia, China. She was so beautiful and so perfect and so loved by us already, but she was so malnourished and sick. We knew her medical needs were potentially more severe than her file outlined, and we were correct. Her file listed repaired tetralogy of fallot, microtia/atresia of the left ear, hearing loss in both ears, asymmetric crying facies syndrome, global developmental delays, and cognitive delays. We instantly knew there were likely some more needs that were undiagnosed/undisclosed, but we said yes to her knowing how complex her medical needs were; there was nothing that would keep us from our daughter! 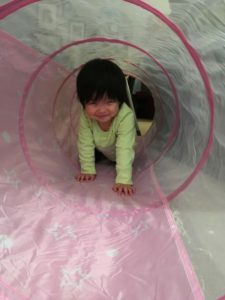 Once home, we were met with a whirlwind of medical appointments and testing. 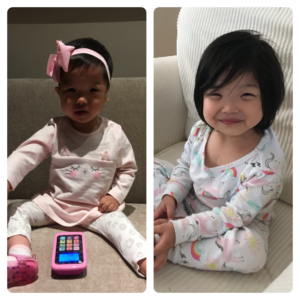 During her first year home, Clara saw 12 specialists over a period of 56 appointments and had 12 procedures and 8 rounds of blood work done. It was a crazy year! But oh my”we saw Clara transform from a terrified and broken shell of a child to a little girl with a smile and personality that lit up the room. 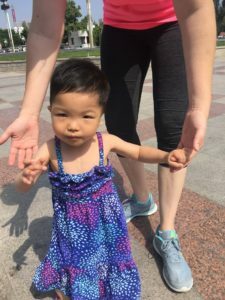 She went from laying on the floor while unresponsive to learning to walk, run, climb, and explore with abandon. She went from completely non-verbal to beginning to learn basic signs (using ASL) and communicating her needs. She also grew a substantial amount; she went from size 6 month clothing and newborn size diapers (at 30 months old) to size 2T and size 4 diapers. One of our favorite changes was watching her develop an adoration for her older siblings and start following them around the house and mimicking them. By summer of 2018, Clara had developed into a sassy, spunky, vivacious little girl who truly loved life and loved her family. While she had been blossoming emotionally, she was also making big gains medically. By summer 2018, her medical needs were all under control and well managed. She was considered in maintenance at that point so we only needed to her all of the specialists once a year. It felt so good to have reached that point after such a long year. Our family was finally feeling settled in a good place and was enjoying life to the fullest. Then in July 2018, Clara’s personality started to change. She started becoming more clingy and less playful. She then became really constipated and nothing we nor her pediatrician could suggest worked so we had to have her admitted to the local Children’s Hospital for a full GI clean out. She was there for three days. Two days after discharge, she started throwing up. She threw up fifteen times that first day. The ER said she likely caught a virus during her GI clean out and prescribed Zofran and sent us home. Over the next four days, she continued to vomit in excess. We took her to GI, her pediatrician, and then back to the ER before they finally admitted her. She was there for eight days while they completed every test they could think of. During that time, Clara continued to lose weight. She lost 25% of her body weight before they placed a ng tube. She also started losing some of her milestones, which the doctors attributed to her nutritional status. She was discharged with the ng tube and more Zofran on Friday, August 10th. 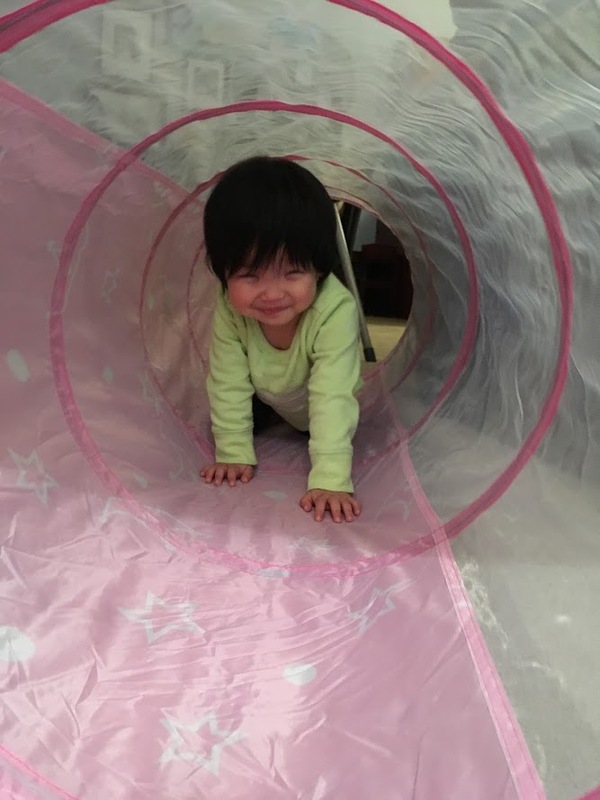 That weekend, Clara started reacting to her ng tube due to her severe oral aversion; she kept gagging and chewing on her tongue and was just miserable. I called the hospital and spoke to the GI attending multiple times about my concerns. I begged and pleaded with them to give Clara a g-tube, which the attending eventually agreed to do. We were told to come to the hospital on Monday to be directly admitted for the surgery. We arrived on Monday and were seen by the nurse, the resident, the attending, and the surgical resident within an hour of arriving. Everyone said she looked good, and we could move forward with the surgery the next day. The nurse gave Clara some intranasal versed to calm her down before placing her IV”standard procedure for Clara given her very severe medical trauma. Within minutes, Clara crashed in my arms, and I went running for help. They tried placing an IV to pump her full of fluids, but they couldn’t find a vein so they called for an ICU team to assist. The two ICU nurses arrived and started working on her while the ICU charge nurse watched the monitor and chatted with me about how they do this often, and it’s not anything to worry about. Suddenly, she jumped up and started yelling asking if her BP was really dropping that fast. She ran it again and immediately called a Code Blue. The room swarmed with about 30 people while I was pulled into the corned by the floor resident doctor and a chaplain. I watched as six ICU doctors worked tirelessly to find a vein to place an IV while also bagging her to keep her alive. When her blood pressure reached 30/22, they called for the drill and drilled directly into her bone to place the IV line. It was terrifying, but she was stable. I was assured that all was well now. 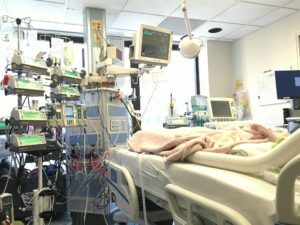 She would spend the night in the Pediatric ICU, receive her g-tube the next day, and be back on the floor by the next night. My husband arrived at the hospital shortly after that to stay the night with us in the PICU. We were both so shaken up but grateful that the scare was over, and our daughter was okay. At 4;45 AM the next morning, the lights in Clara’s PICU room were flipped on, and the room filled with doctors and nurses. After a calm night, Clara had suddenly become very tachycardic, and no one knew why. From there, everything started to fall apart. They attempted to place a central line for better access, and she crashed again. It took them an hour to stabilize her, during which they had to place a breathing tube. She went on to have two echocardiograms and two EKGs that all showed her heart was fine. The team started exploring other options and ran many other tests, all of which brought no new information, all while Clara continued to decline rapidly. By Thursday, they told us the only option that made sense (since everything else had been ruled out, and her heart was still acting up) was her heart, but since the two echos and EKGs had shown everything was fine, they needed to do an emergency heart catheterization to see if they could gain any new information. They made it very clear to us that this was a last resort because she was dying, and they didn’t know why. They also made it clear that there was a high probability that she would die on the table, but there was nothing else they could to save her at that point without any new information. It was horrific. We said good-bye to our precious, beloved baby girl as did all of the doctors and nurses who had worked with her up to that point. The attending from the night shift showed up, and both her and the daytime attending had tears in their eyes as she was wheeled away to the cath lab. Everyone was there to say their last good-bye to our daughter, which was both touching and heartbreaking. By the grace of God and the skilled hands of the best anesthesiologist around, our daughter LIVED through the heart cath. Our sheer joy turned to terror as we soon learned our daughter was in full heart failure”biventricular diastolic dysfunction to be exact. She was moved to the Cardiac ICU where we met an incredible doctor who went on to save our daughter’s heart. It took weeks of meds and waiting and many, many scary moments of almost losing her, but she and her heart were saved! Throughout her recovery, Clara remained comatose on light sedatives with a breathing tube. She never woke up and very rarely initiated a breath on her own. The machines were keeping her alive. 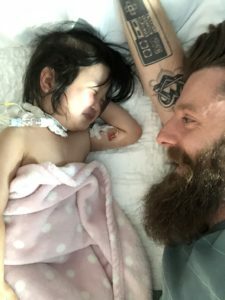 The doctors started to talk to us about a tracheostomy for our daughter, but we wanted to give it time, thinking it might not be necessary as we weaned her sedatives, and she started waking up. She had never had any respiratory issues so we (nor her ENT who came to speak to us) had no reason to believe she would need a trach for breathing support. Unfortunately, as they started weaning her sedatives, she wasn’t becoming more responsive. 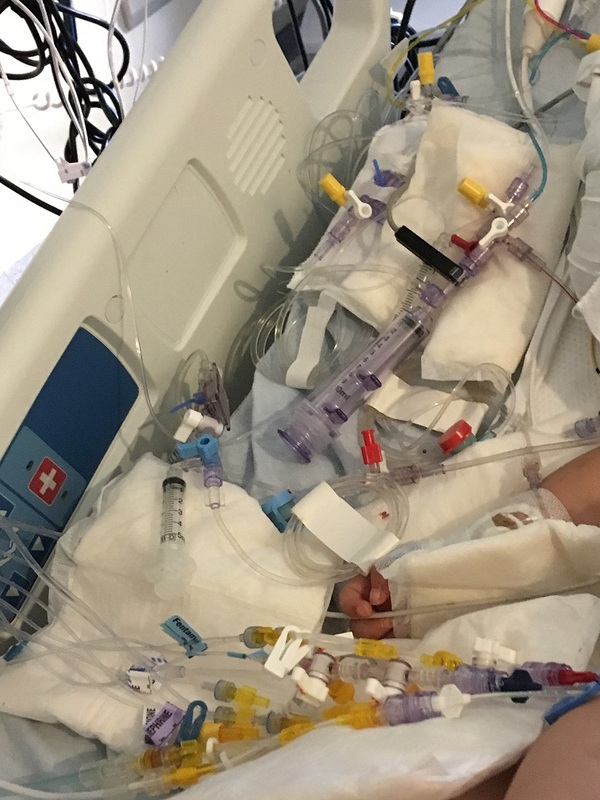 The team called for an MRI, and from that, we learned our daughter had suffered a hypoxic brain injury due to poor profusion from her failing heart. One of the areas affected was the hypothalamus, the part of the brain that impacts consciousness and sleep. They again prepared us for her death. They did not think she would wake up. It was devastating. After all, our daughter had lived through heart failure! Now this? It was too much. My husband and I decided that if our daughter was going to die, we wanted to spend our last few days holding her. That was not an option with her breathing tube so we asked for the tracheotomy. The team agreed, understanding our reason for that choice. Then miraculously, our daughter woke up! SHE WOKE UP! Our baby girl was ALIVE! Thank you, Jesus! Clara’s tracheotomy was scheduled for the following Wednesday, but when she woke up, she was just struggling so much with the breathing tube due to her severe oral aversion. She kept chewing on her tongue and gagging so much that the surgery was moved up to Sunday (on a holiday weekend!). After the tube came out, Clara’s tongue would not fit in her mouth. In fact, it was white”yes¦.WHITE. Clara had developed a very rare complication from the breathing tube called ischemic necrosis of the tongue. The ICU was worried she would lose her tongue. In an effort to save it, she was sedated and medically paralyzed so that a bite block could be placed in her mouth in an attempt to restore blood flow to her tongue. No one knew if it would work, but it was the only option they had. Thankfully, it worked, and Clara did not lose her tongue. The next six weeks were spent in patient with many highs and lows. Clara moved out of the Cardiac ICU to the Cardiac Transitional Care Unit, and then from there she moved to the pulmonary floor to start weaning her vent settings. 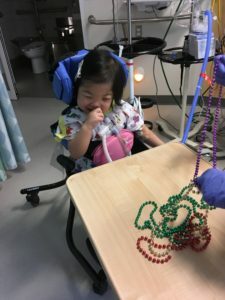 During this time, the team weaned down her ventilatory support in the hopes that she would be able to leave the hospital with only the trach”no vent support needed. Unfortunately, she developed a viral infection and then a bacterial infection that left her already weak lungs even weaker. She went from minimal support for a few hours a day to needing much more invasive support during all sleeping hours. Despite that, she continued to have periods of rapid decline that led to her being moved to the PICU two separate more times. It was eventually determined that Clara also needed oxygen support 24/7. Clara was released from the hospital on October 30 and is now home right where she belongs. Our precious girl has a lot of added œaccessories”trach, g-button, oxygen”that we have had to learn how to operate and care for, but even with the extra work, we have happily embraced it all; we are just so thankful she is still alive. We have a long road ahead of us as we work to see if Clara will ever be able to gain her strength back again. At this time, she is no longer able to climb, run, walk, or even stand up at all. Even just sitting up in a chair with invasive support is challenging for her. We are hopeful that one day she might walk again, but for now, we start with the basics and work up from there. Clara’s shining personality has returned, and she is just as sweet and sassy as she was before everything. As a family, we are all working through the emotional trauma we sustained and will likely continue to need to do so for a very long time, but we also rejoice in the fact that our family of six is all together again under one roof. We take each day one at a time, relishing in the gift of all being together once again. Thank you, Ashley and David, for sharing your family’s journey with us. You are in our thoughts and prayers! 100% of donations will go towards the Pitts Family, and our other three Angels in Adoption. Please specify on your donation that it is for Giving Tuesday.